It's fair to say that I've been genuinely underwhelmed with the TV output for the past month or so but thankfully this week has finally offered up a vast array of telly highlights which I've had the honour of unpicking and will present my opinions on right now. With Endeavour and Vera having both finished their runs this year, ITV has decided against putting another crime drama in their prime Sunday night slot at least for one week. Instead Sunday saw the channel air the two hour epic Churchill's Secret which focused on the period in 1953 when Winston Churchill suffered a series of strokes. In my opinion Stewart Harcout's adaptation of Jonathan Smith's novel has a lot in common with The King's Speech as both focus on a commoner's relationship with a prominent, powerful figure at a crucial time in their lives. In this case the commoner is fictional Nurse Millie Appleyard (Romola Gari) who is drafted in to care for Churchill (Michael Gambon) following his stroke as the family decamp to their summer residence of Chartwell. Whilst in reality Churchill would've been cared for by a team of nurses, the story relies on the differences between the down-to-earth Northern nurse and the bloody-mindedness of the Prime Minister. Both are at a crossroads in their life with Winston struggling to carry on running the country at the age of seventy-eight whilst Millie is about to travel to Australia to live with her fiancée, a trip that she's not exactly looking forward to. On the surface the drama is about Churchill's recovery and the ways in which Millie helps the Prime Minister to walk again. But to me it's about how Churchill's family have struggled to live in his shadow and the way in which they've struggled not to be associated with him. In fact I would've like to have seen more from Churchill's children Randolph (Matthew Macfayden), Diana (Tara FitzGerald) and Sarah (Rachel Stirling) all of whom have complex personal lives. The scene in which their dirty laundry is aired round the dinner table is explosive and is one of the only occasions in which Churchill's Secret really comes to life. In some ways I think there's scope for a spin-off involving the Churchill siblings however I don't think that this will ever materialise. For a period drama that focused on the state of the country in the early 1950s, I'm surprised how much I enjoyed Churchill's Secret. I think this is primarily due to the fact that Harcourt decided to focus on the characters rather than the story. The story did employ quite an amount of dramatic license especially in terms of the fictional character of Millie Appleyard who was able to get both Winston and Randolph to follow her orders with very little resistance. Millie is our way into the story and therefore Harcourt goes out of his way to make her sympathetic with her need to stay in England as she's proud of the NHS proving to be a very relevant line considering the recent news stories concerning the health service. The odd couple relationship between Winston and Millie is well-played by both Michael Gambon and Romola Gari who shared a very impressive chemistry. Gambon never tried to impersonate Churchill which I think was part of the charm of his performance and he portrayed the Prime Minister's recovery excellently. Meanwhile Gari played Millie as every inch the heroine and also was able to stop the character slipping into cliché due to her multi-layered turn. 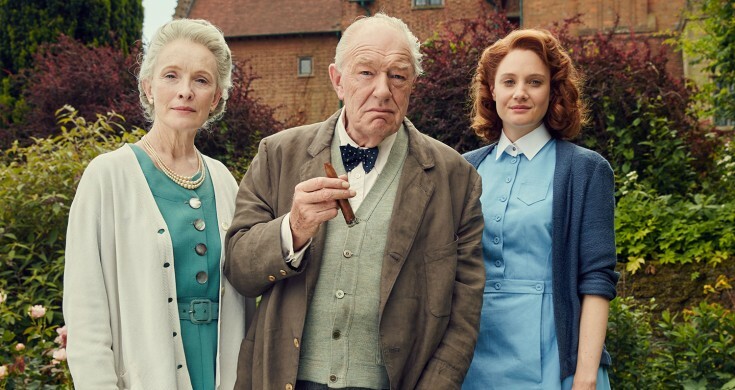 However for me the drama was almost stolen by Lindsay Duncan who was absolutely terrific as Clementine Churchill; the matriarch of the family who was trying to stop her brood from tearing strips off one another. Brilliant support was given by the actors playing the Churchill children most notably Matthew Macfayden who showcased a new side to him that I've never seen before. 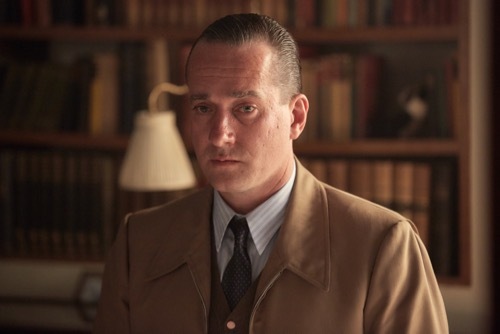 Rather than utilising his leading man looks, Macfayden seemed to have put on some weight to convincingly portray the anger and bitter son who never quite lived up to his father's image of him. The drama was enhanced by the seemingly unlimited access that the crew had to the Churchill residence of Chartwell which is now a National Trust property. Chartwell almost becomes a character itself with its rooms hiding several Churchill family secrets and being the place where many memories come flooding back to Winston and his brood. Although at times it does stretch credibility, I never felt that Churchill's Secret particularly flagged during its two hour running time which is a testament to Harcourt's well-paced script. But Churchill's Secret's best element was it fantastic ensemble cast all of whom gave believable and sympathetic performances to make this a cut above your normal historical drama. Moving on we have a very different drama that's targeted to a very different audience in the form of Thirteen. 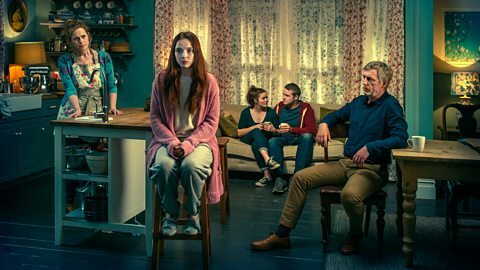 Marnie Dickens's five-parter gets BBC Three's new online channel of to a blistering start drama-wise thanks in part to a great premise and a brilliant central performance. The beautifully choreographed opening scene of Thirteen sees the disorientated Ivy Moxam (Jodie Comer) stepping out of a house, her eyes blinded by the sunlight. Soon she begins running towards a phonebox and makes a 999 call which eventually allows the audience to learn that Ivy has been missing since she was thirteen years old. The police are baffled partly because the girl who has arrived at the station looks nothing like the police artist's sketch of what she would look like today. There are also some gaps in Ivy's story which lead the police to believe that she isn't who she says she is however a DNA test later reveals that the girl is in fact Ivy. Dickens also looks at how Ivy's reappearance affects her family and friends who have seemingly moved on with their lives. Her parents (Natasha Little and Stuart Graham) have recently separated after her father had an affair with his PA with whom he now lives. Meanwhile her sister Emma (Katherine Rose Morley) is about to get married to her boyfriend whilst Ivy's former boyfriend Tim (Aneurin Barnard) has already got hitched. It is Emma who casts doubt in the minds of the audience when she doesn't think that the girl who claims to be Ivy is actually her big sister. The gaps in Ivy's story also don't go unnoticed by DS Lisa Merchant (Valene Kane) who feels that the escapee may have developed Stockholm Syndrome and is secretly aiding her kidnapper. However Merchant's partner DI Elliot Carne (Richard Rankin) takes an instant liking to Ivy and she starts to see her as one of the only adults she can trust. But as the episode unravels it's clear that Ivy isn't a particularly trustworthy source and she may be a lot more devious than we initially give her credit for. It's the doubts we have about Ivy's story which separates Thirteen from other dramas that have focused on kidnap victims escaping after many years in captive. The most obvious comparison is with the multi-award winning movie Room but whilst that focuses on a relationship between a mother and son this is more about returning as an adult to a world you left as a teenager. These themes are well-represented through the central performance of Jodie Comer who is absolutely spellbinding as Ivy. She plays Ivy as an innocent child trapped in the body of a young woman and she skilfully uses the mannerisms of a person much younger than her. But there is an extra layer to the character of Ivy that Comer is also able to explore as uses her seeming innocence to wrap people around her little finger. She is able to dispel any of the doubts in Elliot's head by complementing his abilities as a protector whilst Tim is also coy about revealing his new relationship to his childhood sweetheart. Even Emma is eventually convinced that Ivy is who she says she is after she helps her do her make-up before she meets up with Tim for the first time in thirteen years. I feel it's in the audience's instincts to believe Ivy in a similar manner so it's a testament to both Comer and Dickens that this distrust starts to creep across the drama as the episode continues. There's also a shocking conclusion to this first episode that changes the entire tone of the series and makes us see Ivy in a new light once again. So great is Comer that when she's not on screen Thirteen doesn't seem as gripping and I personally wasn't that interested in the marital problems of her parents. That being said there are some great supporting turns most notably from Richard Rankin and Katherine Rose Morley. But apart from some problems with the minor characters, Thirteen grips you from the word go and never lets your attention slip. With some brilliant direction, a great script from Dickens and crucially a superb central turn from Comer, Thirteen is the BBC's second drama triumph after Happy Valley. The only worry I have is that people won't seek it out online but if you're a fan of quality TV drama than I urge you to go on over to the BBC Three website and spend an hour with Ivy Moxam as I can assure you you won't be disappointed. Rounding off our trio of dramas is Murder, a format which first came to us as a one-off BAFTA-winning drama back in 2012. Following the critical acclaim that Robert Jones's drama received it was recommissioned but for some reason it's taken over three years for it to return to our screens. This series of Murder features three self-contained stories all of which follow the same formula as the 2012 piece. The format itself sees all of the characters talking directly to the screen telling us about events after they've occurred and as a result constantly changing our opinion of the story. Director Birger Larsen also makes sure that the pace of the drama never flags by cutting the monologues together with video footage of the day of the crime plus still photos of some of the pieces of evidence. This week's first episode, entitled The Third Voice, focuses on the murder investigation of Rafe Carey (Frank Gillhooley) who was initially thought to have drowned following a fishing trip with his brother-in-law Leo Durridge (Peter McDonald). However when his body was recovered it was revealed that Rafe died from a stab wound and Leo immediately became the prime suspect. What I liked about Jones's drama was the way in which details about the relationship between Leo and Rafe were revealed sporadically rather than right at the start. Soon a motive was given as we learnt that Leo blamed Rafe for the death of his daughter who contracted meningitis under his brother-in-law's care whilst he and wife Katrina (Shauna Macdonald) were on holiday. 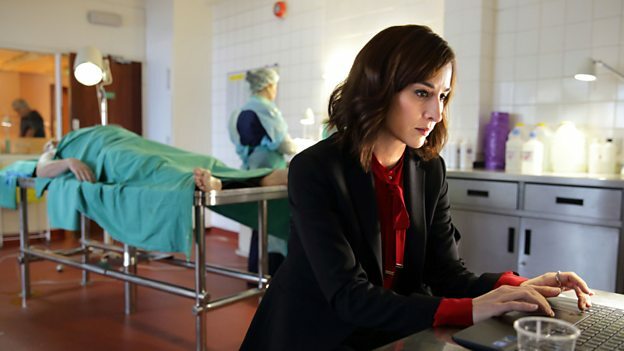 Investigating the case was DS Corinne Evans (Morven Christie) who had just returned from a forced leave of absence following several charges of insubordination. Unusually for an hour long drama quite a substantial portion of Murder was devoted to Corinne's back story as we learnt how she broke down following the death of one of her friends which had an impact on her work. We heard from both the police psychologist and a medium that Corinne visited both of whom give different opinions on the investigating officer. These opinions do give us new insight into Corinne and explain her frustration when Leo refuses to answer any of her questions relating to the murder case's newest suspect in the form of the troubled Frankie (Conor McCarron). I was a big fan of the initial Murder drama and feared that it would never return due to the fact that this new series had been put on the back-burner for so long. Whilst the Third Voice didn't quite live up to the promise of the initial one-off instalment it was still a cut above your normal crime drama. Firstly the style of the piece was completely different from anything else on TV both in terms of Jones's script and Larsen's direction. Larsen in particularly never lets you rest on your laurels and constantly bombards the screen with images of the day of the murder and the various pieces of evidence. Both Larsen and Jones make sure that the audience has to concentrate on every single minute of Murder or they might miss some crucial to the plot and I have to admit that I had to wind back my copy several times to listen again to certain parts of the piece. Rather than presenting a linear version of events, Jones's story sometimes leaps forward into the future with the latter parts of the drama jumping from the initial confession to the High Court Trial. If there was one part of the drama that didn't particularly work for me then it was when Murder focused on Corinne's back story and the demons that she was harbouring. In particular I found the scenes with the medium to be surplus to requirements and I didn't think this character added anything to the overall story of The Third Voice. Apart from that though I found the story was gripping from beginning to end with all of the main actors delivering their monologues with the right amount of conviction. I was particularly impressed with the performance delivered by Morven Christie, an actress who I've never been that impressed by in the past. In The Third Voice I found her performance as Corinne to be absolutely riveting to the extent that I was a little upset that this was only a one-off. Christie was especially brilliant in the moments in which the camera stayed on her after she stopped talking as we were able to understand her frustration with Leo's silence during questioning. As Leo, I felt Peter McDonald was equally great and particularly convinced me of his character's grief over the death of his daughter. Overall I found The Third Voice to be a complex and well-told murder mystery that benefited from Larsen's superb direction and Jones's gripping script. After the evidence on display both here and in the 2012 instalment I can't wait to see what the next two episodes of Murder will be like and if there anything like what's been delivered already then I won't be disappointed. 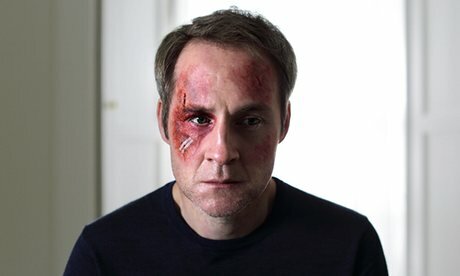 Oddly Murder wasn't the only BBC Two programme this week to feature warring brothers-in-law as they were also at the centre of darkly comic thriller Stag. Created and written by Jim Field-Smith, the creator of the wonderful The Wrong Mans, alongside George Kay the programme follows the exploits of a boisterous gang of men on a stag party. Stumbling along as a late arrival to the hunting weekend is Ian (Jim Howick), a mild-mannered geography teacher who is totally different to the other stags celebrating the last weekend of freedom of Johnners (Stephen Campbell Moore). Ian's weekend gets off to a bad start from the get-go as he's left at the side of the road by the rest of the party before being landed with a bar bill from the local pub's stern waitress (Sharon Rooney). Events soon take a dark twist when the men are abandoned by the local gamekeeper (James Cosmo) and forced to fend for themselves in the wild. Quickly some of the party are picked off and are thought to be killed whilst the rest start to turn on each other with suspicion quickly falling on outsider Ian. 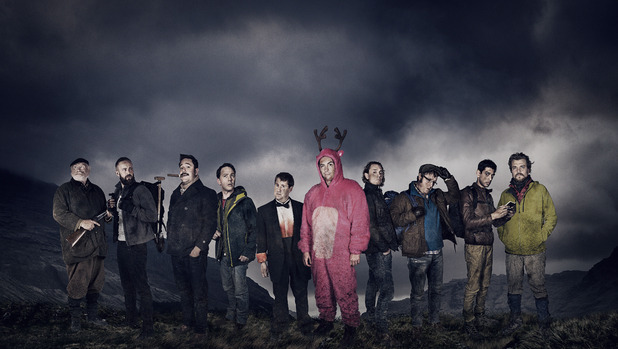 I have to admit it took me a while to adjust to Stag which has none of the charm or quirky British humour which made The Wrong Mans such a joy to watch. The majority of the characters in Stag, with the exception of Ian, are initially unlikeable toffs who are described by the mild-mannered Aitken (Tim Key) as the worst kind of people. But as Kay and Field-Smith's story continues they start to reveal complexities in the characters all of whom seem to be hiding secrets of some kind. The writing duo also seem to have done their research into the sort of genre they want Stag to fit into with the general tone being that of horror thriller. There are definitely elements of both The Wicker Man and Deliverance both in the presentation of the local community and the way in which the party start to be picked off. The humour is also subtly presented with a lot of smutty, laddy banter mixed in with some genuinely funny one-liners. The ensemble cast bounced off each other perfectly with Howick brilliantly portraying the awkward outsider and the rest of the gang having excellent chemistry. I especially liked Reece Shearsmith's brief appearance as the party member who wants to escape his family as well as Borgen's Pilou Asbaek as the Danish oddball. Although I've already got an idea of how Stag is going to end I'm intrigued enough to carry on watching what must be one of the most unique TV shows of the year so far. Finally we come to another celeb laden reality show where the risk of injury is high however I think those taking part on Bear Grylls: Mission Survive are just lucky they're not doing The Jump. Not that they probably thought that while they were downing their own urine after having bitten through the best part of an unappetising worm. In fact it's the scene where the celebrities drink their wee that most people look forward to on this show and that's why the producers have obviously decided to put it towards the end of the first episode. I'm not actually sure what the point of Mission Survive is other than to give the celebrities who think I'm a Celebrity is above them to have a go at a bit of a trek. One thing you don't get on I'm a Celebrity is Bear Grylls coming up to you every five minutes and shouting at you for doing something wrong. That's what the seven stars who signed up for this show got though as Bear acted like an angry parent to the contestants throughout the show with the constant look on his face being that of someone who wasn't upset just disappointed. Maybe he just wanted them to work for their probably sizeable appearance fees or maybe just somebody had poked him either way he didn't look happy. The stars were a motley crew of sort of recognisable faces but even I wasn't sure who Alex Scott was until it was explained that she was a female footballer. The people who grabbed the lion's share of the screen time in the first episode were those with reality TV experience namely Dancing on Ice judge Jason Gardiner and Strictly Come Dancing runner-up Chelsee Healey. It was Healey who played her part of the ditzy girl perfectly and it was clear from the off that she was going to go home, not that she seemed to be bothered all that much. Of those left I've got a feeling that Les Misérables star Samantha Barks is going to win as she has the right attitude about how to approach each challenge. However I was surprised about how well soap legend Michelle Collins did especially when it came to tackling her own urine. Overall Mission Survive is an easy to watch reality show albeit one that takes itself a little more seriously than it possibly should do. That's your lot for now remember to follow me on Twitter @mattstvbites and I'll see you next week.